The Greenland shark (Somniosus microcephalus) an iconic species of the Arctic Seas can reach 5 meter in total length, with a life span well beyond those of other vertebrates. The species is large yet slow-growing, with a rate estimated to be around 1 cm per year. It is a slowly moving shark with a preference for deep water, that is sometimes also seen scavenging around fishing boats. Although the shark is an apex predator like the great white shark, it is seldom seen hunting other species like sea lions, which is probably due to its ice cold environment. While the Greenland shark is one of the world's largest sharks, it is one of the least understood animals on our planet. Its general biology and way of life have been a mystery to biologists for many years. Recently an international team of marine biologists from the University of Copenhagen's Department of Biology, has revealed one of this shark's many secrets (Nielsen et al. 2016). They investigated 28 female species (varying between 81- 502 cm) collected in Greenland between 2010 and 2013. The Danish lifespan study was based on a method called radiocarbon dating. Radiocarbon - also called 14C- is constantly being created in the atmosphere by the interaction of cosmic rays with atmospheric nitrogen. The resulting radiocarbon combines with atmospheric oxygen to form radioactive carbon dioxide, which is incorporated into plants by photosynthesis; animals then acquire in their tissue 14C by eating the plants. Because 14C decays at a known rate, the proportion of radiocarbon left in tissues can be used to determine how long it has been since a given sample stopped exchanging carbon – the older the sample, the less 14C will be left. Normally radiocarbon is derived from calcified bony tissue, but since this is absent in the Greenland shark, Nielsen et al used the center of its eye lens. This does not change from the time of a shark's birth, and hence allows the tissue's chemical composition to reveal a shark's age. They further used the ‘bomb pulse’ as a time marker. 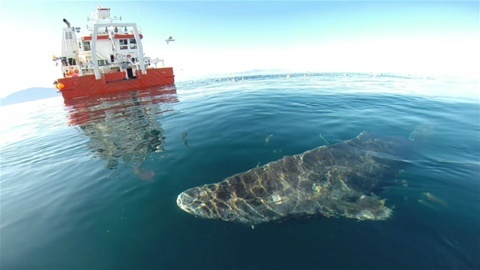 The bomb pulse refers to a sudden increase of carbon-14C produced by nuclear tests in the 1950s—specifically, its incorporation into the eye during development—to determine the age of Greenland sharks. The bomb pulse has often been used as a time stamp to validate the age of marine animals. The smallest sharks in the sample (less than 2 meter) showed the highest radiocarbon levels, implying that their dates of birth would be close to bomb pulse onset (around 1960; when bomb-produced radiocarbon becomes detectable in the chronology of the Northern Atlantic species). The age of the prebomb sharks was estimated by using a calibrated time scale. This is a statistical method to predict the most probable age on the basis of the actually measured radiocarbon in the eye lens, under a set of biological and environmental constraints. Such as climate and individual variations. size at birth, rate of growth etc.